If home is where the heart is, shouldn’t it be beautiful? Yard of The Month beautiful. Family Landscapes can make that happen for you. Get the yard you see when you close your eyes. That’s because Family Landscapes starts by understanding your vision, your needs, and your capabilities. If you’re looking for beds to care for, Family Landscapes can create them. Do you want a carefree yard? No problem. Lawns, gardens, pavestone, and lighting: Family Landscapes is a one-stop solution for transforming an okay yard into a showplace. Pick your look. Set your budget. Let Family Landscapes do the rest. 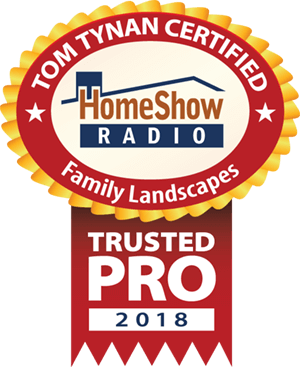 Serving the Greater Houston area, Family Landscapes is a trusted HomeShow Pro, certified by HomeShow Radio’s Tom Tynan. Fill out this form for priority response from Family Landscapes. How can Family Landscapes help you? •Side-by-side landscaping makeover with two happy endings?